Watch as these balloon twisters in VA twist and turn simple balloons into amazing creations. Everyone at the party will get a special balloon sculpture, which makes the party much more fun. "Providing the Best in Entertainment"
Jason Levinson & Company provides a wide variety of party entertainment services for Birthday parties, Holiday parties, Company picnics, Grand openings, Conventions, Trade shows, Weddings, Corporate affairs, Promotions and more! Their entertainers travel throughout the Baltimore-Washington DC, N. VA, Annapolis and Frederick metro areas for your convenience. Jason Levinson & Company offers airbrush artists, balloon twisters, caricatures, clowns, face painters, holiday characters, jugglers, magicians and stilt walkers – just to name a few! Visit their website for a complete list and call to book your entertainment today. 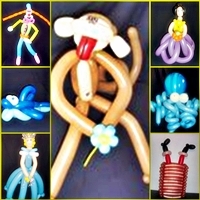 Brighten up your event with colorful and creative balloon sculptures! Jason Levinson & Company’s skillful balloonists can twist up an assortment of large and small creations including crazy hats, animals, flowers, creatures and more! 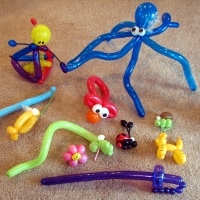 Each guest can take home their unique balloon sculpture, making them great party favors as well! Balloonists are a great addition for parties large and small. Ask about your balloonists coming dressed in a clown outfit for added fun! Serving Gettysburg, Pennsylvania, and Beyond! "Let Your Adventure begin With Us!" Balloons are the best way to celebrate any special event! Nothing will brighten up the occasion like a bunch of festive and colorful balloons! Fun will definitely be added to every event in the hands of one of Adventure in Fun’s seasoned balloon entertainers as they twist balloon sculptures on the spot! From quick and impressive to specialized custom balloons, their number one priority at Adventure in Fun is to provide your guests with a memorable experience that they will not soon forget! Their balloon artists will astonish your guests with impressive specialty balloon sculptures that will bring delight and joy to every guest! 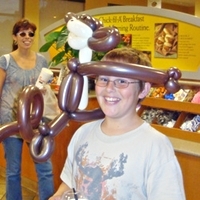 Adventure in Fun also provides stunning and unique high quality balloon décor. They specialize in turning the ordinary into extraordinary with custom designed balloon decor that will make your event unforgettable. 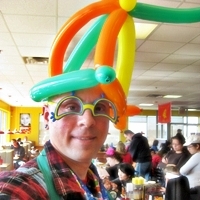 Hang on and hold on to your seats as Mike Becvar, the owner of Balloons By Mike, will be at your party as the hands down best clown in Northern Virginia. He is a professional clown who is insured through the World Clown Association, a member of Clowns of America-International, the Mid-Atlantic Clown Association and KIDabra. Mike Becvar became dedicated and so passionate about becoming a clown at an early age that he pursued his dream of becoming one when he went to Mooseburger Clown Arts camp back in 2008; he further continued his education at Circus Magic, ClownFest, the Kapitol Klowns convention and some more conventions. 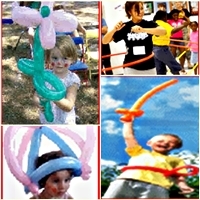 Balloons By Mike in VA aims to entertain and provide wholesome fun for all kids in Northern Virginia. You may visit his personal website for further information about Balloons By Mike. Face Painting & Balloon Fun! Don’t have a mixed feeling about having party entertainers for your kid’s birthday. Having this kind of entertainer at your kid’s party can be worth your dime when it comes to making your beloved child happy on his special day. When it comes to party entertainment services, Dee Vinchy can be relied on. Once contacted, Dee Vinchy in VA will bring to your party their expertise in providing entertainment through their face painting and twisting of balloons in front of your guests. Even adults enjoy this kind of entertainment too, more especially with your child and the whole bunch of birthday guests! Virginia’s Dee Vinchy is an award winning face painter and balloon twister that serves and entertains Virginia, Maryland and Washington DC. They can be contacted thru their official website provided here. With husband and wife Earl and Kimberly, with two adopted sons Rian and Chase, Vertical Kids passionately entertains young people, kids that is, for any occasion that they might have. Earl and Kimberly also promote Christianity through their way of providing entertainment for kids. Their goal is to provide one very good memorable entertainment for kids that have a solid spiritual value that can be cherished and treasured by any kid as they grow old. Vertical Kids in VA started in October of 2001 and since then they have been providing a great deal of entertainment with a combination of magic, puppets, balloon twisting, juggling, animated with humor and audience participation. So if you’re looking for some form of entertainment for your kid’s party with character molding that will last a lifetime, bring Virginia’s Vertical Kids to your kid’s party. 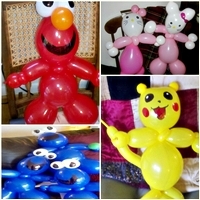 Balloon Creatures & Magic has an advantage over some other party entertainers out there, especially in Virginia alone. 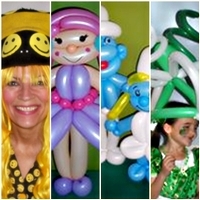 Virginia’s Balloon Creatures & Magic is an all-around party entertainer from a child’s birthday party magician, a clown, a balloon twister and can even be a princess party entertainer. Susan, who is the one behind all these entertaining characters, can entertain any kid celebrating their birthdays in Hampton Roads, Richmond, Virginia Beach, Suffolk, Franklin, Chesapeake, Smithfield, Portsmouth, Newport News, Norfolk, Gloucester, Yorktown, Moyock, Williamsburg and Elizabeth City. 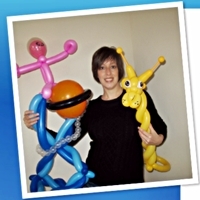 For your complete line of party of entertainment needs, you can hire Balloon Creatures & Magic in VA. Go ahead and call her up now so she can begin hitting the road on the way to your party! 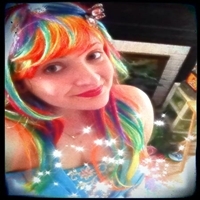 Jelly Bean Queen is an honest to goodness balloon twisting entertainment provider in Northern Virginia. She is a member of World Clown Association and is one professional “extreme” balloon twister who has a passion for making children smile. Virginia’s Jelly Bean Queen constantly updates her balloon sculptures from time to time to meet the demands of children of the new millennium. Her forte is to let her clients. The children choose what balloon artwork they would want to create during the party. Doing that will surely bring the enthusiasm and the astonishment of the children while watching those ordinary balloons turn into wonderfully sculptured arts. Jelly Bean Queen in VA has proven this trick to be most effective with kids as she has been doing this successfully for many years now. What is good about her is that she charges fixed prices only with no hidden costs! Balloon Twister With a Twist! Do you remember that time when you were a kid so amused and were astonished how that balloon twister turned those balloons into sculpted arts? 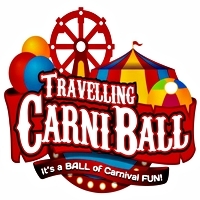 Bring those memories back and let your child experience such amusement and astonishment by the entertainment service that Travelling Carniball provides. This time, the Travelling Carniball in VA brings that kind of party entertainment with a twist. They just won’t be twisting those balloons but they can do those of your choice with a clown, face painting or glitters, character shows and party princess, all can be combined in one show. Virginia’s Travelling Carniball has those packages for a balloon twist party adding up some twist into it. They can include characters, music, clowns or anything that you may find in a carnival. It’s like immersing all the carnival performers into your kid's party! Face painting, temporary tattoos, body painting & effects, and balloon twisting are the skills that Let’s Make A Face has in their service that are being offered for any occasion. Occasions like birthday parties, Christmas and holiday parties, school fairs & festivals, community picnics & block parties, church events, company outings, summer picnics, store openings, customer appreciation days, Halloween parties, campaign events, trade shows and all other events are what they like to serve most! Let’s Make A Face in VA was also featured on Fox 5, NBC 4 and in the Old Town Patch because of their outstanding skills. Making those events memorable can be possible with Virginia’s Let’s Make A Face. For their balloon twisting entertainment, please contact them for details. Kids love balloons and would surely wonder, “How in the world did he do that?” when they witness the balloon artists of Jelly Bean The Clown. What Jelly Bean The Clown in VA aims for is to meet your party entertainment needs by providing world class sought after performances by Jelly Bean himself. Jelly Bean was sought out by the Ringling Brothers and Barnum & Bailey Circus’ Talent and Production Coordinator because of his entertainment skills. That one was quite a feat for any clown out there! Jelly Bean never stops in honing his entertainment skills as he continuously attends conventions for this type of expertise. Virginia’s Jelly Bean The Clown are awaiting your kid’s party to invite him to perform and showcase his party entertainment skills! Owners of Davy The Magician, Davy and Tabatha Schultz, are both Christians doing party entertainment as part of their mission of spreading the gospel to the children. All their performances are infused with some bible teachings and values of life. They have been in this entertainment business for more than 10 years now, while for the ministering it’s about 20 years already. For the balloon twisting, it is being done mostly by Tabatha herself. Tabatha, or mostly called as Tabby, is the balloon twister who is also very talented in face painting for kids and adults. She sometimes plays the role of a clown during the party if requested. Festive Effects would be glad to hear you from the other end of the line to bring their professional entertainers, specifically that of their balloon twisters, to be in with your party guests and the celebrant. The talented performers of Festive Effects in VA are all professionals and are ready to fulfill their commitments once booked for your party. They are all well-honed and experienced when it comes to partying! Once booked, their sculpted balloons will be all over in the air! 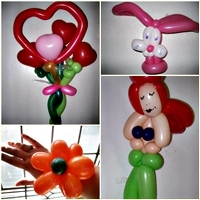 Magnificent crafting of balloons infused with lots of fun will surely bring smiles to everybody! So book in advance now to make sure that you will get Virginia’s Festive Effects’ talented professional entertainers, or balloon twisters that is, all setup and ready to go for the big event of your child! 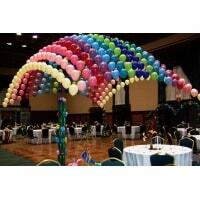 Sculpted balloons are not only great for birthday parties; they can be one great tool to promote your business. Here, Rainbow Rose The Princess Clown believes that sculpted art balloons can attract attention and get more customers! Even for your businesses that are celebrating anniversaries or more especially holding its grand opening, balloons will surely catch the eyes of the passers-by. Rainbow Rose The Princess Clown in VA is very skillful when it comes to designing your rooms or spaces in the business with their sculpted balloons making it more livelier and attention-getting. Virginia’s Rainbow Rose The Princess Clown can be contacted through the phone number provided herewith for your birthday parties, school and church fundraising events, yard sales, picnics, company events and even wedding receptions. Want to bring the kid out of you? Then tap Travis Schwartz, the owner of Balloon Dude Travis, to perform and tickle your funny bones while twisting balloons for you! Yes, he can not only bring laughter and fun to the children but even adults will truly enjoy his funny antics. Using his childish funny antics together with his skillful balloon creations, watching him perform at your party or any event can bring smiles all over the party! 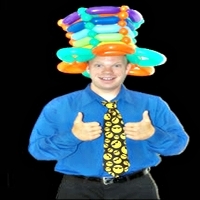 Balloon Dude Travis in VA has been twisting balloons and entertaining his audiences at any party, event, restaurant, church and school since 2007. He is also a Christian Speaker and would love to share the good news of Jesus Christ while entertaining with his skillful balloon twisting.